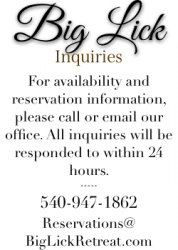 Nestled in the mountains surrounding Lake Moomaw in the Western Virginia Highlands, the accommodations at Big Lick Retreat offer unparalleled outdoor amenities. Enjoy hiking, mountain biking, fishing, watersports, and wildlife at your leisure – with all the comforts of home! Whether you’re looking for a vacation packed with outdoor fun, or a lazy weekend snuggled in mountains, Big Lick Retreat is your perfect getaway. The lodges offer outstanding lake and mountain views—Lakeview and Stoney Bottom Lodge both feature gorgeous views of Lake Moomaw, and Chestnut and Eagle Roost Lodge feature views of Virginia’s famous Blue Ridge Mountains. Bring your family and friends– we’ll provide the view, the comforts of home, and the fun!